More miserabilism in the news that parents who give their children booze as part of a bid to promote considerate drinking produce more binge drinkers than parents who don’t. A story in The Lancet (“Association of parental supply of alcohol with adolescent drinking, alcohol-related harms, and alcohol use disorder symptoms: a prospective cohort study”) looks at Australian parents who respond to surveys and their children. Researchers found that, on average, 62 per cent of teenagers who got booze from “other sources” went on to “binge drink” – against 81 per cent who got booze from their folks and other sources. Just 25 percent of those who got alcohol only from their parents binged. As ever, if you run out of policy ideas, just tell the mob your interventionism is about protecting the kids. You can come up with pretty much any from of prohibition if it is dressed up as protecting der kinder. In short, parental supply is not associated with any benefit (ie, reduction in drinking behaviours or harms). These results support the promotion of a precautionary approach to adolescent alcohol supply by parents; to reduce the risk of alcohol-related harm, parents should avoid supplying alcohol to children. Non-supply appears to be the safest option (obvious in some ways), if the parental and societal aim is to protect the health of adolescents and young adults. One issue with this story must be what is defined as binge drinking. It’s…4 drinks in “one session”. Is that a binge? 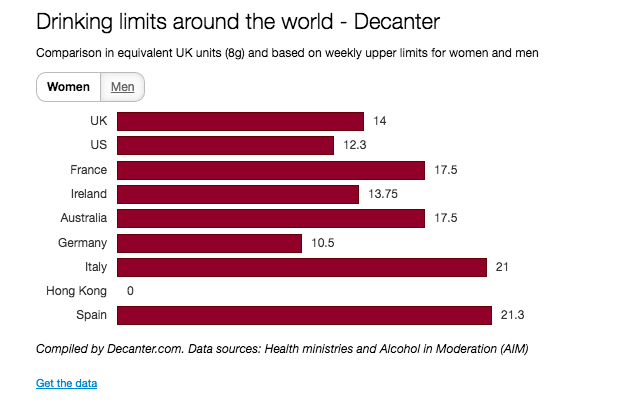 The NHS says men and women are advised not to drink more than 14 units a week on a regular basis – and that’s one of the lowest recommendations in those part of Europe that bother to cook up advice. That’s “six pints of average-strength beer or 10 small glasses of low-strength wine”, says the NHS. Given that the study included 18-year-olds, might it be that binging is actually drinking responsibly? No thanks, mate. Risk is part of growing up. I’ll have a pint of mother’s ruin – and a family ticket to Seville.